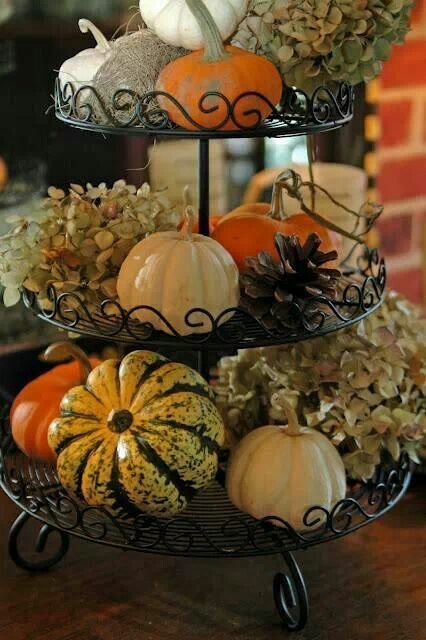 When this weather of ours finally cools off I will start bringing down the fall and Halloween decor. Usually Halloween comes out around October 1st and then transitions into Fall for Thanksgiving. I have been decorating pretty much the same since we moved into our home 7 years ago so I am in need of some new fall decor inspiration. 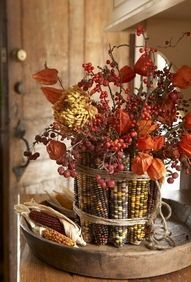 I thought I share some easy Fall Centerpieces and Mantels I found searching the web and Pinterest. 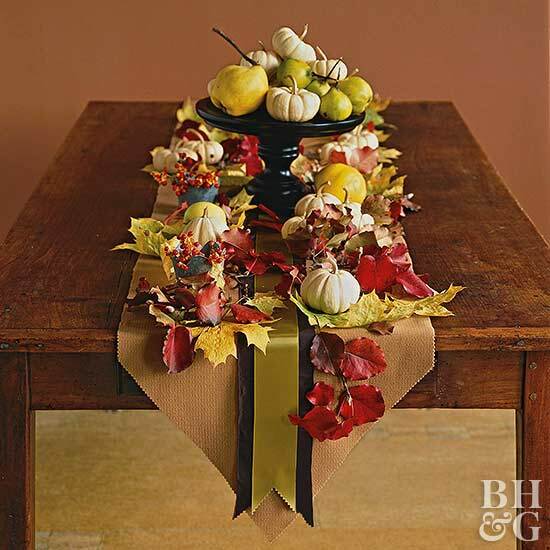 This would be perfect for Thanksgiving, from BHG. Another easy one although I would not use multiple candles just one thick one probably. Also add to bigger vases around the house. 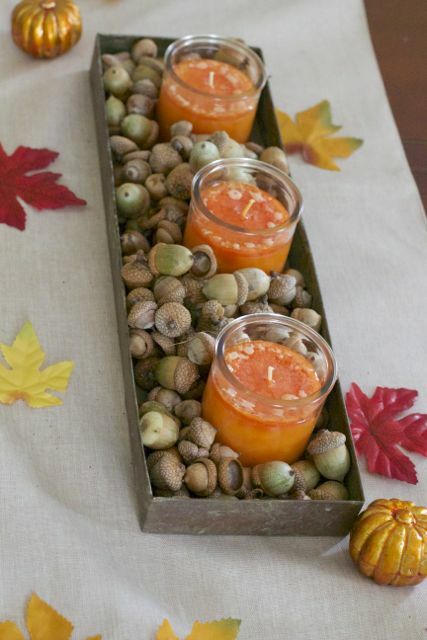 You can use items you have around the house and outdoors to create this easy acorn centerpiece. Now isn’t this clever. Using wine glasses at candle holders. Definitely something I have not used. A perfect way to use up those mismatched glasses. We all have tiered cake dishes or even cupcake holders might work. Wrap an inexpensive vase with twigs and fill with flowers that match your decor for a simple Fall centerpiece this year.. Super simple yet elegant. Here is the same idea but using Indian Corn. 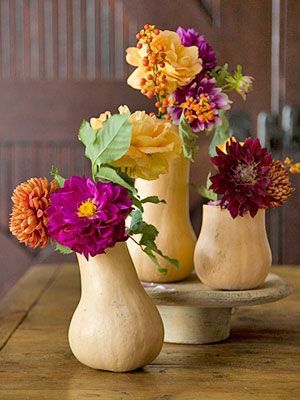 I have seen people use pumpkins as vases but love love the gourd twist. Also love the bright colored flowers on this fall centerpiece. Love the girls from Shanty 2 Chic, they made these from 2×4’s. You might be able to use an old drawer and cut it down too? Although they just use glue in their instructions. This next one uses a small hay bale you can find at craft stores as it’s base. Just be sure to put a cloth on the bottom so it doesn’t scratch your table. 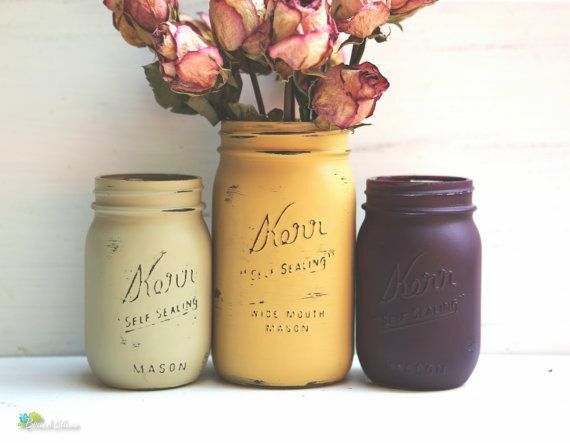 Your fall centerpiece can be as simple as painting some old mason jars and adding simple flowers. 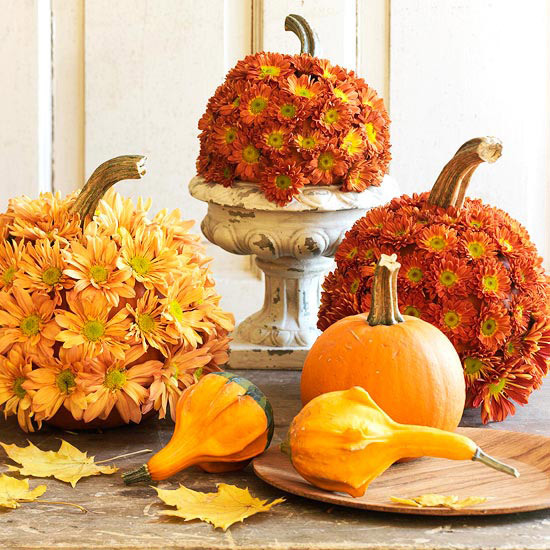 Which Fall Centerpiece do you prefer? 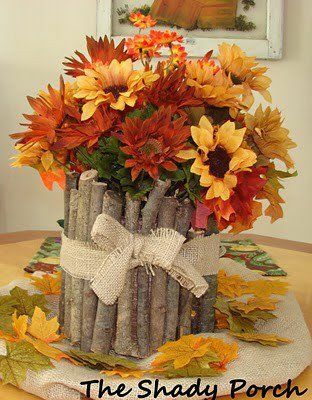 These are some great ideas, I love using the sticks wrapped around the flower vase. I love the wineglasses that double as a candleholders. Having mismatched ones just adds to the charm! Great picks. Fall is my favourite time of the year. I love them all!! I love the colors of Fall, but it seems we go from Spooky ghost right to Christmas trees and we miss all these beautiful pieces! I have the cupcake tiered plate that is somewhat decorated like that already. Now I will go find some more decor to put with what I already have. Thanks for the share. love it!! What lovely centerpieces! I love decorating for fall and have a few lanterns I picked up at Pier 1 that are in my living room, but have two lonely candlesticks and a new tablecloth on my dining room table. Need to dress the rest of the table up! 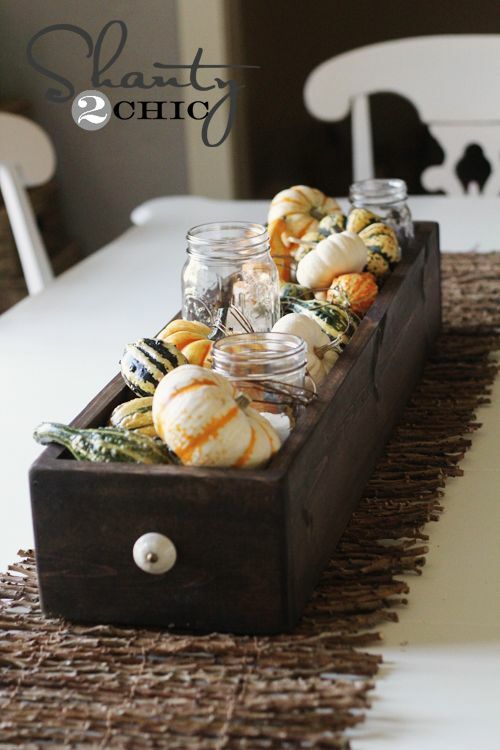 Love the drawer full of gourds and mason jars/candles. Such a clever idea! I love the ones under the dome…and funny thing is that my mom was saying she’s into that as well now….she saw one at the antique store, she should’ve bought it!